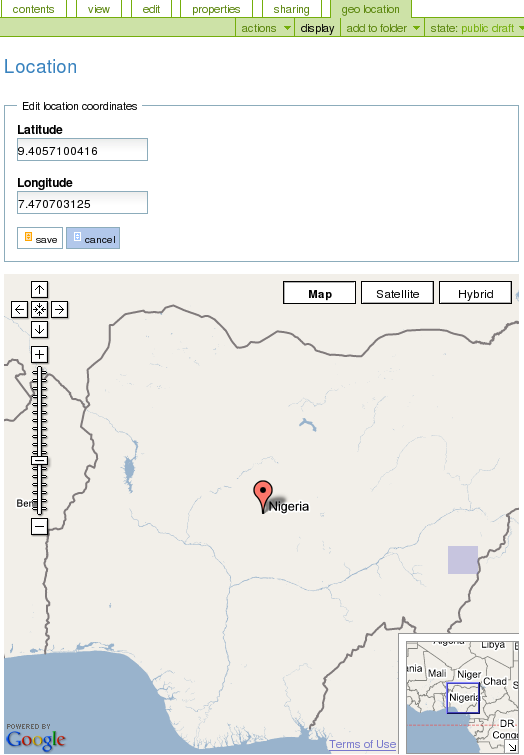 Any object with the latitude-longitude has an additional map portlet displaying this object. This portlet, in turn, has a template "Large screen". If you click on the ''"large screen"'' below the portlet, you will be able to see the full-size map of the page with its description. 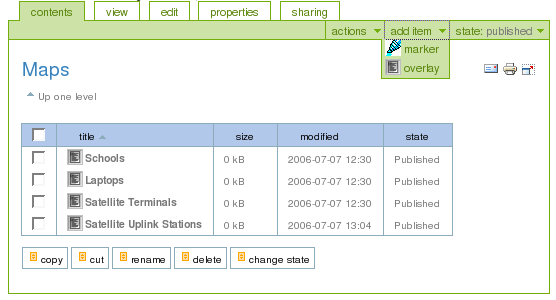 The folders containing objects with the latitude-longitude parameters have an additional display view - "maps view", which gives an opportunity to see the full-size map with all these objects. 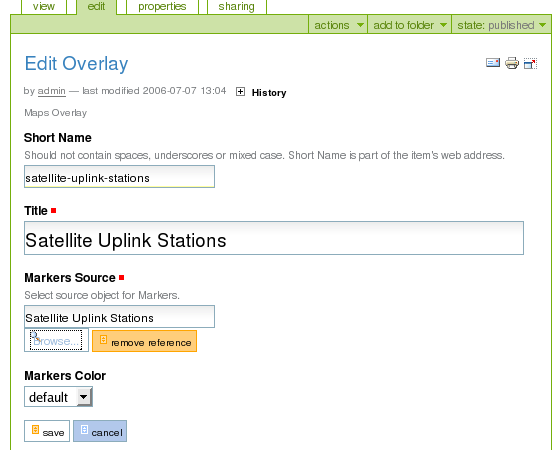 There is a new content type "Map" which can have other content types - "overlays". 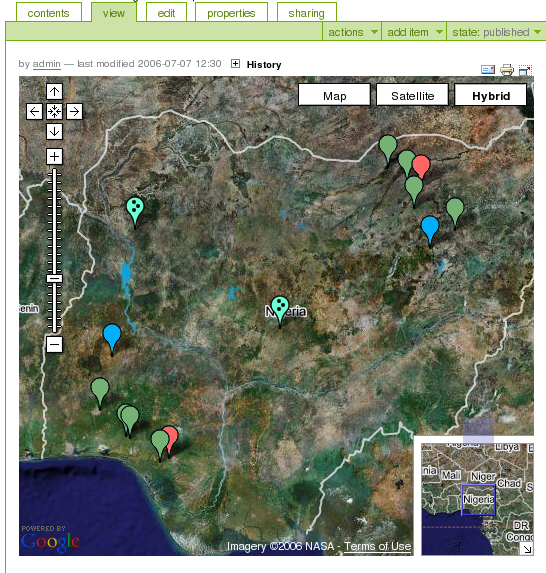 It enables the positioning of different objects on one map showing them with the markers of different colours. 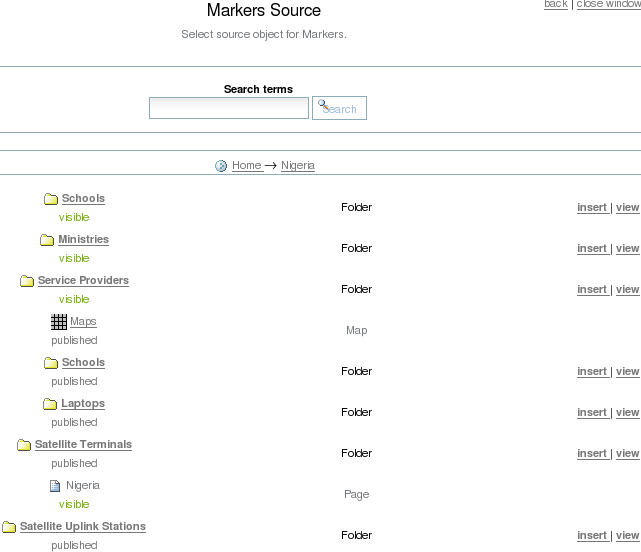 Let's assume you need to show two objects(Plone pages)situated in one folder on one map. Suppose you have a folder "School"
Go to the page "School 1" and click on the tab "geolocation"
Do the same steps for the page "School 2"
Go to the folder "School"
Let's assume, you need to show many objects situated in differnt folders on one map. Suppose, you have a folder "Nigeria". Go to this folder and add "map" item from the "add item" drop-down menu. Complete the same steps for creating overlays for other objects of the folder "Nigeria"